You are here: Home › News › The Bridge Is Back! by Jim Loew The long nightmare is over! The construction on the Humboldt Avenue Bridge is complete. Hop in your cars, grab your bikes, throw the kids in the stroller. Drive across, ride across, walk across. The bridge is finally open! The long nightmare isover! 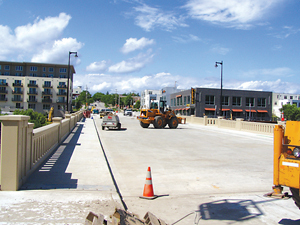 The construction on theHumboldt Avenue Bridge is complete. Hop in your cars, grab your bikes, throw the kids in the stroller. Drive across, ride across, walk across. The bridge is finally open! The new bridge is actuallytwo bridges – one going over Riverboat Road and another over the MilwaukeeRiver proper. The old bridgesimply had to go. It was over 50years old and in all sorts of disrepair. Although it may have been tempting to do the usual Milwaukee routine–slathering the potholes and cracks with asphalt and tar year after year – cityinspectors determined these ancient structures had to be torn down. The safety of the bridge-crossingpublic was in question. It wastime to bite the bullet and start the rebuilding process. The initial timetable calledfor the construction process to begin September 2008 and end November 2009,taking fourteen months to complete. Instead, demolition began a month late – in October. The slated completion date was alsopushed back, this time six months behind the original estimate, to June30. What was originally planned totake just over a year ended up taking almost two. Several construction issuescaused delays. In the early phasesof construction it was discovered that soil conditions were a far cry from whatwas observed initially. Thefoundation of the Riverboat Road bridge had to be substantiallyreconfigured. As engineers wentback to the drawing board, construction on this portion was put on hold and theorder of operations revised. Thecity now planned to work on the section bridging the river first. There were othercomplications as well. Because theestimates regarding the foundation were inaccurate, the retaining walls betweenthe two bridges had to be redesigned. Despite the delay, the new design was less costly than itspredecessor. Another problem was locationof utilities. The gas and electriclines drawn up on the blueprints didn’t match what was actually on site. To avoid disruption of service toresidents and businesses nearby, extensive field surveying was conducted andthe plans redrawn. But that’s all in the pastnow. There’s a lot to like about new bridges. For one, they are expected to last close to a hundredyears. Members of the MilwaukeeArts Board reviewed the designs of the two bridges and approved thearchitecture, ensuring their visual appeal. Also, the narrow sidewalks that had pedestrians squeezedbetween the railing and road are gone. The new ones are much wider and include scenic lookouts over theMilwaukee River. The bridge itselfis wider, too, increasing from 28 feet to 44 feet. Plus, the bridges are safer due to improved sight distancingfor those driving over it. The many inconveniences ofthe Humboldt Avenue Bridge being out of commission can’t be stressed enough –from the re-routed No. 10 bus line, to re-routed traffic, to the suffocatingstrain it put on businesses near the water’s edge. But the new Humboldt Avenue Bridgeis safe, sturdy and handsome. Let’s take a moment to celebrate that Riverwest isreconnected to the Lower East Side and downtown. The Humboldt Avenue Bridgeover River Boat Road will open to traffic on Wednesday, June 30 at 5 PM after aribbon cutting ceremony that will include 6th District AlderwomanMilele A. Coggs, 3rd District Alderman Nik Kovac, and Public Worksofficials. Representatives from the Riverwest Neighborhood Association, BradyStreet BID, Brewers Hill Neighborhood Association, and the East VillageNeighborhood Association are invited to participate. The public is invited tocheck out the new and improved Humboldt Avenue Bridge starting at 3PM. Some ofthe new design elements include a wider width from 28 feet to 44 feet, whichwill match the roadways; sidewalks on the bridges are wider, with two sceniclook-outs on the bridge over the river; a new pedestrian stairway from CommerceStreet to Riverboat Road and the ramp from River Boat Road to North HumboldtAvenue has been changed to an off ramp from North Humboldt Avenue. There are many other aestheticallypleasing elements of the bridge that can be viewed up close without the risk ofhaving vehicles on the bridges. There will be displays on theramp from the bridge to Commerce Street from organizations located in nearbyneighborhoods. Stubby’s Pub and Grub (located in the former Bayou space) willoffer samples of their menu and Lakefront Brewery will be present as well. Thecommunity is encouraged to remain the area for local establishments’celebrations.